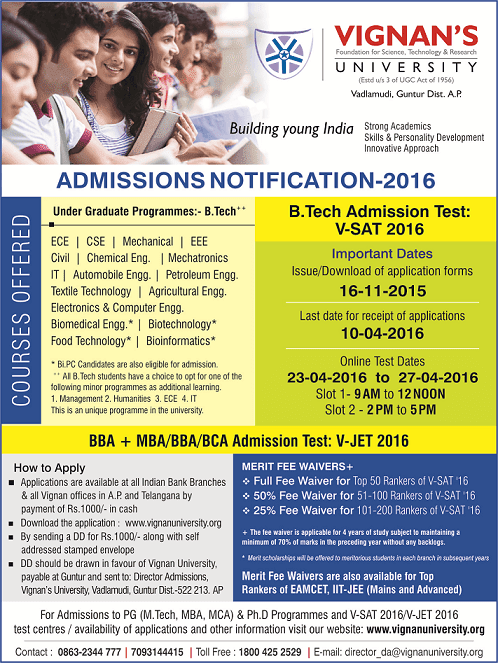 Vignan University B.Tech Admission 2016 (VSAT 2016) Notification, Application Form. V-SAT 2016 was an online entrance exam conducted by Vignan University for taking admission to Bachelor of Technology (B.Tech) programs in Agricultural Engineering, Automobile Engineering, Biotechnology, Chemical Engineering, Civil Engineering, Computer Science & Engineering, Electronics & Communication Engineering, Electronics & Computer Engineering, Electrical & Electronics Engineering, Information Technology, Mechanical Engineering, Mechanics and Textile Technology for the commencing session 2016. 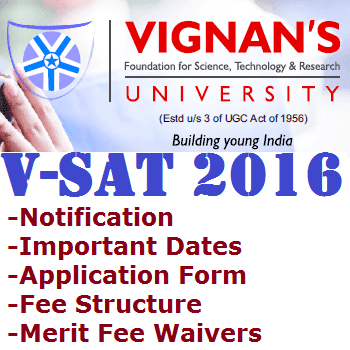 The Vignan University (VSAT) 2016 Admission Application Form is available through various sources as follows. The candidate can obtain the VSAT 2016 Application Form at all Bank Branches in Andhra Pradesh as well as Telangana by paying Rs.1000/- cash. The candidate can also get the VSAT 2016 Application Form from all Vignan Offices in Andhra Pradesh and Telangana. Download the Application form from www.vignanuniversity.org by Sending a DD for Rs.1000/-along with self addressed stamped envelop. DD should be drawn in favour of Vignan University payable at Guntur and send to Director Admissions, Vignan University, Vadlamudi, Guntur, Andhra Pradesh - 522 213. We are here providing you the Counse wise Vignan University B.Tech Fee Structure for the Academic Year 2016-17 below for you to check the fee details semister wise along with Admission Fee and Tuition Fee particulars. 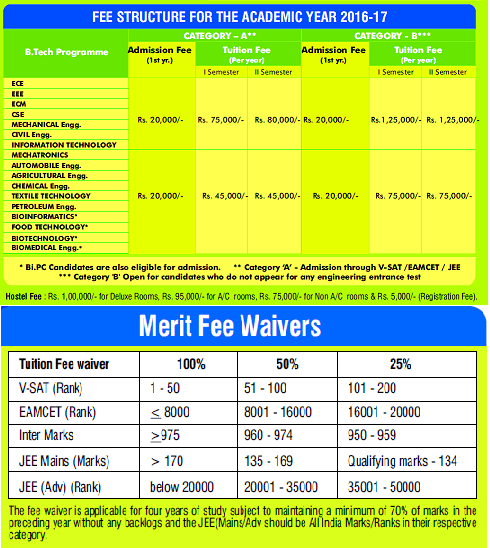 We are also provided the Merit Fee Waivers for the VSAT, EAMCET, Inter, JEE Main and JEE Advanced (Ranks) holders below.